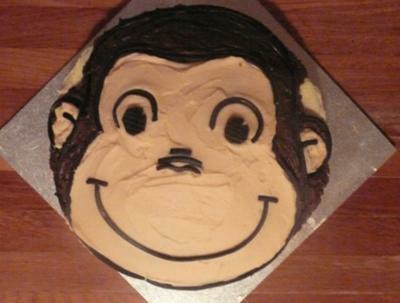 To make this Curious George monkey cake, bake 1 plain butter cake in a round tin. I used a colouring in picture of George as a guide to shape head and position eyes, ears, nose and mouth. I coloured the icing a pale yellow for face, and used cocoa powder to do remainder of fur/head. To bring out highlights and form of face, mouth and nose I used strips of licorice and cut out flat pieces of licorice for the eyes. You did a very good job! He looks perfect!!! !